In Tuesday’s battle of the bottom four, Aston Villa were the only side to emerge with a victory, beating fellow strugglers Reading 1-0, thanks to a goal from transfer deadline day signing, Christian Benteke. That win moved Paul Lambert’s Villa side out of the relegation zone, at the same time consigning Reading to second bottom, four points from safety. The other fixture that night featured Harry Redknapp’s first official game in charge of Queens Park Rangers and he saw his new club earn a goalless draw away at Sunderland; though with a tally of just five points from their opening fourteen fixtures, QPR will need their new manager to find a way to start winning matches, something they have been unable to do so far this campaign. You didn’t see me throw this challenge flag, right? For the ninth consecutive season, the Detroit Lines lost their Thanksgiving day home game, this time succumbing 34-31 after overtime against the AFC-leading Houston Texans. 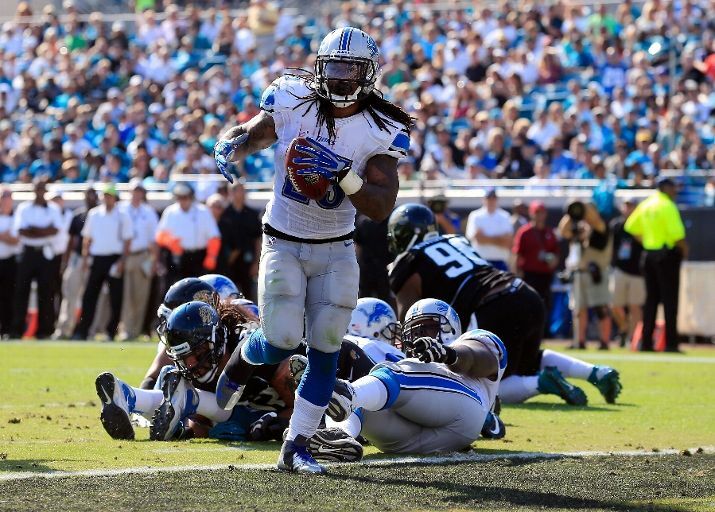 The Lions played a part in their own downfall last Thursday, in particular their coach, Jim Schwartz who threw a challenge flag after Justin Forsett’s third-quarter 81-yard touchdown run. Detroit had led 24-14 at the time and, while Schwartz was correct in his assertion that Forsett was down early on, the NFL does not allow coaches to challenge scoring plays, which are automatically reviewable and the throwing of the flag prevented the officials from analysing the replay. Despite this mistake, the Lions still had the opportunity to win the game in overtime, but a 47-yard field-goal attempt on third down hit the upright and on the next drive, Matt Schaub drove the Texans into Detroit territory to allow kicker Shayne Graham to secure their 10th win of the year. The other two Thanksgiving Day games were not such close contests: the Redskins led the Cowboys 28-3 at half-time and went on to win 38-31, on the back of a fantastic performance from rookie quarterback, Robert Griffin III, who threw for 304 yards and four touchdowns; while the Patriots scored three TDs in 52 seconds as they racked up 35 points in the second-quarter alone, eventually beating the Jets 49-19. On Sunday, there were two rematches from the NFC playoffs last January and the outcomes remained the same, as the NY Giants thrashed the Packers, 38-10, and the San Francisco 49ers got the better of the New Orleans Saints, 31-21. That loss for Green Bay allowed Chicago to move a game clear at the top of the NFC North, after they had beaten divisional rivals Minnesota, 28-10, earlier in the day. With their new manager, Harry Redknapp, watching from the stands, Queens Park Rangers took the lead away at Old Trafford, but three goals in eight minutes gave Manchester United a 3-1 win and propelled them back to the top of the Premiership. Jamie Mackie had a goal correctly ruled out for offside before half-time, but the Scottish international did put Rangers in front in the 52nd minute, providing the finish after Lindegaard had only managed to parry a cross from Kieron Dyer. The goal was hardly against the run of play, as United had been struggling to get a grip of the midfield – Paul Scholes had started alongside Darren Fletcher in the middle of park, but the veteran looked all of his 37 years and it was only when Sir Alex Ferguson replaced him with Anderson, that the home side began to dominate. Two headed goals from corners – including one by Fletcher, who was starting his first match in over a year after being sidelined with a bowel complaint, which at one point looked like it might end his career – had given the home side the edge, then a third from substitute Javier Hernandez sealed the points for the Red Devils. QPR showed a marked improvement in their performance from their previous week’s defeat against Southampton at Loftus Road, but Harry Redknapp takes the reigns with the club seven points from safety at the foot of the table, still searching for their first league win of the campaign. 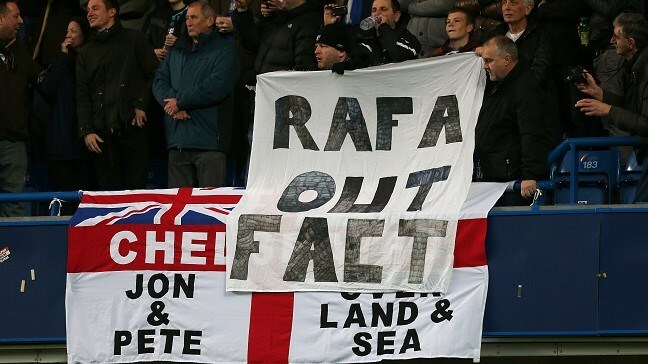 Liverpool and Chelsea during Benitez’s reign at Anfield, this level of opposition to the appointment of one of the seven managers to have won the Champions League in the last ten years is staggering. Although, perhaps it should not be as this pedigree has meant nothing to the club in the past – alongside Rafa, Ferguson, Pep Guardiola and Frank Rijkaard in winning the European Cup this past decade, are three men who have been sacked by Chelsea – Jose Mourinho, Carlo Ancelotti and Roberto DiMatteo. This level of anger over the appointment of a new manager is unprecedented – not even former Arsenal boss, George Graham, got such a negative reaction when he took over at White Hart Lane, with Spurs fans choosing to greet his arrival with silence and never sang his name (a traditional chant became “Man in a raincoat’s blue and white army”), but he was positively welcomed in comparison to Benitez. 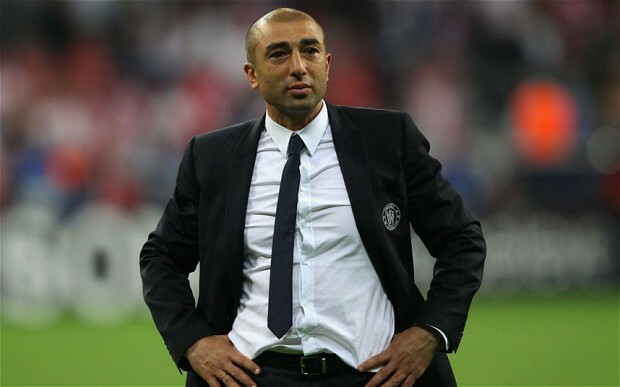 In a move that typified the “what have you done for me lately?” nature of modern football, Chelsea sacked Roberto DiMatteo as their manager this week, a mere six months after he had secured the club their first Champions League trophy. The Blues had started the season strongly and were four points clear at the top of the league after eight matches, but last Saturday’s 2-1 defeat away at West Brom marked the fourth Premiership game in succession from which Chelsea had failed to emerge victorious. That recent dip in form had seen them drop to third in the table, themselves now four points behind the leaders, Manchester City – whom they host this weekend – and seemingly the final straw for owner Roman Abramovich came with a 3-0 defeat away at Juventus, leaving them third in their Champions League game with just one game to go. However, DiMatteo would have been within his rights to expect more faith from the Russian after he brought such success to the club last season, when their campaign had looked doomed under Andre Villas-Boas. Chelsea will be hoping that the formula that brought them two trophies in May will work again this year, as they have appointed Rafa Benitez as the interim manager for the remainder of the season. Benitez also has unlikely European Cup win on his resume – in 2005 with Liverpool – and he takes charge of Chelsea in time to lead them at the Club World Cup, which will be held in Japan at the beginning of December. Nevertheless, even if the Spaniard is able to gain more silverware for the Londoners, he may not earn a long-term contract, as Abramovich has been an admirer of former Barcelona boss, Pep Guardiola, although he may now have competition for his services from the Brazilian national team, who sacked Mano Menezes on Friday. Heading into week 12 of the NFL season, all teams have now played 10 games and had their byes, so the race for the playoffs is really taking shape. 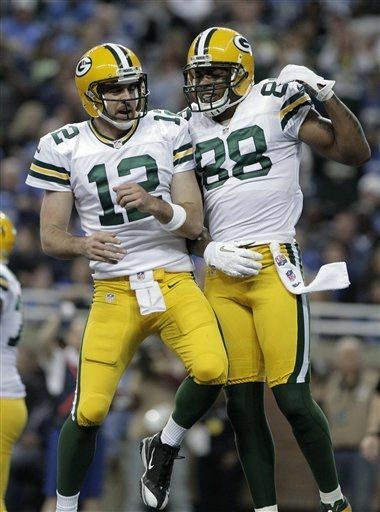 In the NFC North, the Packers, who had been written off by many following three defeats in their opening five contests, won for the fifth time in succession, beating Detroit 24-20 to move to joint top of their division with the Bears. Chicago were without their starting quarterback, Jay Cutler, due to a concussion for their 32-7 loss on Monday Night to the 49ers, who themselves were without Alex Smith, after he had suffered the same injury against the Rams. That win for San Francisco extended their lead in the NFC West to a game and a half over Seattle, who were idle, while both other teams in their division lost: the Rams were beaten by the Jets in St. Louis, 27-13, on the back of a competent performance for the visitors by Mark Sanchez; while the Cardinals were defeated for the sixth time in succession, falling to the Falcons, 23-19, despite picking off Matt Ryan five times. Atlanta’s 9-1 record makes them huge favourites to take the number 1 seed in the NFC, while below them in the South, the Saints moved to 5-5 with a victory in Oakland, 38-17, over the Raiders; and the Buccaneers kept up their push for a wild card berth with a 27-21 overtime win on the road against divisional rivals, the Carolina Panthers. 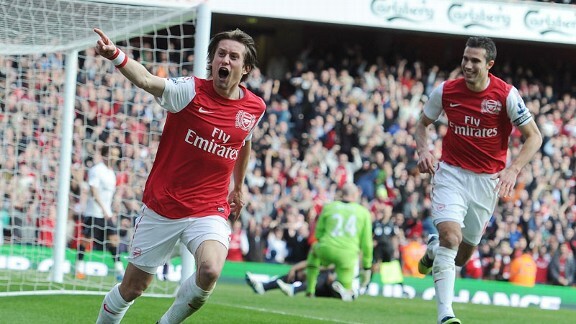 When Arsenal and Tottenham last faced each other at the Emirates in the Premiership last February, Spurs took an early 2-0 lead through goals by Louis Saha and former Gunner, Emmanuel Adebayor; a result that, had it stood, would have given them a 13 point lead over their North London rivals in the race for Champions League qualification. However, goals from Bacary Sagna and Robin Van Persie before the break, then one from Tomas Rosicky and a brace from Theo Walcott turned the game – and ultimately the season – on its head. Arsenal won the match, 5-2, then proceeded to overtake Tottenham in the table, eventually finishing third and ahead of their neighbours for the four hundred and twenty-sixth seventeenth consecutive season. Heading into this weekend’s derby, Spurs once again find themselves above Arsene Wenger’s men in the league, as the sides sit seventh and eighth, with a single point separating them thus far. After a strong start, Arsenal have found themselves in something of a rut and last weekend’s 3-3 draw against Fulham means they have only won one of their last four games, that victory coming against Queens Park Rangers at home. On Saturday, the Gunners took an early two goal lead against Martin Jol’s team, with goals from summer signings Olivier Giroud and Lukas Podolski, but headers from Dimitar Berbatov and Alex Kacaniklic had the visitors back level before the break. Following a foul on Bryan Ruiz in the box by Mikel Arteta in the 67th minute, Berbatov gave Fulham the lead from the penalty spot, but it was only to last for a couple of minutes before Giroud got his second of the game. With the game finely balanced, it was shocking to see many of the Arsenal fans streaming towards the exit prior to the final whistle, a decision which meant that they, like Arteta, missed a last-minute penalty the home side were generously given, after the ball had struck Sascha Riether’s arm in the box. For the first time in four years, an NFL game ended in a tie last weekend, as NFC West foes San Francisco and St. Louis ended up with 24 points apiece after overtime. The Rams scored two touchdowns in the first quarter to open up an early 14-0 lead, but the 49ers pulled to within seven before half-time, only to lose their starting quarterback, Alex Smith, to a concussion. His replacement, Colin Kaepernick, rushed for a score in the fourth-quarter, before running back Frank Gore added another to give San Francisco a 21-17 advantage. Sam Bradford drove St. Louis back down the field and got them to First and Goal from the two-yard line, but the Rams then took a timeout with less than 90 seconds to go – a decision that meant, when they then scored on the next play, they were kicking the ball back to the 49ers with more than a minute left to play. San Francisco duly tied it up to force overtime and twice more St. Louis contributed to their own failure to win the game. An 80-yard pass from Bradford to Danny Amendola was wiped out because of an illegal formation, then a game winning field goal was also nullified as the Rams had failed to snap the ball before the play clock ran out and were called for a delay of game. The tie was the first in the NFL since 2008, when Philadelphia and Cincinnati were also deadlocked after 75 minutes. For the first time since March of 2011, Tottenham failed to score at home in the league last Saturday, falling 1-0 to Wigan, who were good value for their victory. Spurs had been kept in the game by two good saves from their goalkeeper, Brad Friedel – who, despite not having kept a clean sheet in the league this year, was again favoured ahead of Hugo Lloris – but his best efforts could not keep out Ben Watson’s close range shot in the 56th minute. Perhaps the most worrying aspect of the defeat was Andre Villas-Boas’ decision making, as the Portuguese manager chose to withdraw Jermain Defoe – top scorer for the club this season and who had a record of 10 goals in 11 games against Wigan – in favour of Emmanuel Adebayor, shortly after Spurs had fallen behind. With away trips to Manchester City and Arsenal in their next two games, Tottenham need to start showing the form that helped them win four matches out of five in the Premiership, but many of the players are not performing at a good enough level. Kyle Walker has dropped from the high standards he set last season; summer signings Clint Dempsey and Gylfi Sigurdsson are both guilty of holding on to the ball too long and losing possession easily; while AVB’s decision to keep starting slow-footed William Gallas in central defence ahead of Michael Dawson is baffling. For the past twenty years, it would have been almost impossible to do a review of a weekend of fixtures that included Manchester United vs Arsenal without writing about that game first, but last Saturday’s encounter was such a formality for the Red Devils that there is not much to say on it. Former Gunner, Robin Van Persie, opened the scoring inside three minutes and for the rest of the first-half, Sir Alex Ferguson watched as his team squandered numerous chances, including a penalty miss by Wayne Rooney just before the interval. It did not cost the home side however, as they doubled their advantage through a Patrice Evra header in the 67th minute and shortly afterwards, Jack Wilshere was dismissed for the visitors after picking up his second yellow card. It was only in injury time at the end of the game that Arsenal came to life and a well taken goal from Santi Cazorla made the final score 2-1, a result that flattered Arsene Wenger’s men. Now that the season has passed the halfway point, it’s time to check in on how the division races are shaping up and who looks like they might be capable of making a playoff run come January. for the year, with a 31-14 win in Jacksonville, thanks in part to three 2nd quarter touchdowns from their running back, Mikel Leshoure. This weekend, the Vikings and Lions meet in Minnesota with third place in the North up for grabs; Chicago have a tough home game against the Houston Texans, who are also 7-1; while Green Bay have their bye week, something they are in need of with several players – including Greg Jennings, Jordy Nelson and Clay Matthews – struggling with injuries. Following their opening day defeat against the Cowboys, the Giants won 6 of their next 7 games to take a commanding lead in the NFC East, but last Sunday their form left them as they were beaten at home by the Steelers. The Eagles started the year 3-1, but those three victories were by a total of four points and there were signs that their record was inflated, which has proven to be the case over the last month, as they have lost four consecutive games, most recently in New Orleans on Monday night. Although Dallas have struggled thus far, their schedule has been tough – their five defeats have been against the Bears and Giants at home; and away at Baltimore, Seattle and last Sunday in Atlanta – but going forward it gets slightly easier for them, so they cannot be ruled out of a playoff place just yet. Robert Griffin III has given the Redskins hope for the future, but he cannot help this season’s defence, which has given up more than 20 points in every game thus far and ranks 31st against the pass. 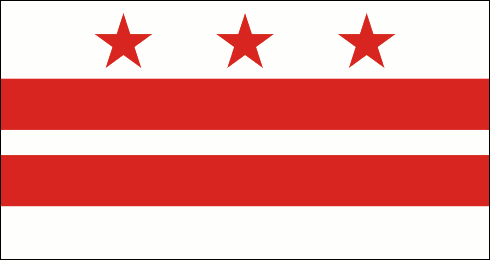 Washington lost their home contest against the Panthers last Sunday – a result that was supposed to be ominous for President Obama’s chance of re-election, but the rule was disproved – and now have their bye week, while the Giants are in Cincinnati, and the Eagles and Cowboys meet in Philadelphia. Atlanta are the league’s only unbeaten team and although their home victories over the Panthers and Raiders were not convincing, their win over the Cowboys last week solidified their position as the probable number 1 seed in the NFC. This Sunday they face the Saints, who are playing this season under the cloud of the bounty scandal and without their suspended head coach, Sean Payton. New Orleans started slowly – losing all of their first four encounters – but have bounced back to take three out of four, mainly thanks to their QB, Drew Brees, who has helped the offence rack up at least 24 points all but once this year. With consecutive wins in Minnesota and Oakland, Tampa Bay have leveled their record at 4-4, though they have had to deal with a Jekyll and Hyde defence that is ranked first against the run, but last in passing yards allowed. At the bottom of the division, Carolina have struggled thus far and Cam Newton has been less impressive in his second year, but they did gain their second win of the season in Washington last time out. This Sunday they host the Denver Broncos, while the Buccaneers face the Chargers in Tampa Bay. The Seahawks improved to 4-0 at home this season with their victory over the Vikings last Sunday and have another game in Seattle this week against the Jets. Defeat in Green Bay in Week 9 means that the Cardinals have lost 5 straight games – after winning their first four – and their bye week has come a fortuitous time. 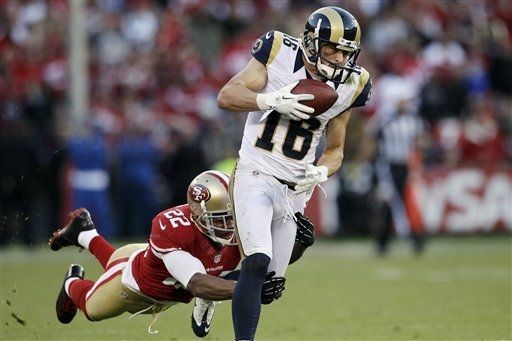 Neither the 49ers nor the Rams – top and bottom of the division – had a fixture last weekend and the two teams face off in San Francisco this Sunday.